I took this image of the Moeraki Boulders in the early morning of a sunny day in November of 2008. I selected a long exposure time to make the motion of the Pacific Ocean visible as it flows around the round Moeraki Boulders. I used a small aperture and a short focal length to make sure the image is sharp front to back. 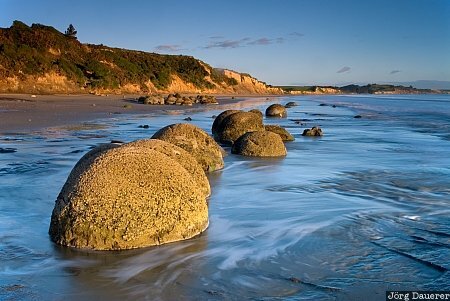 The Moeraki Boulders are at the Pacific coast of Otago on the south island of New Zealand. This photo is part of the exhibition Water in Motion (October 2012). This photo was the image of the month in December of 2010. This photo was taken with a digital camera.